After fitting these bronze filigree pieces with bits of pink and white cabochons, I knew exactly how I wanted to use them in a piece. 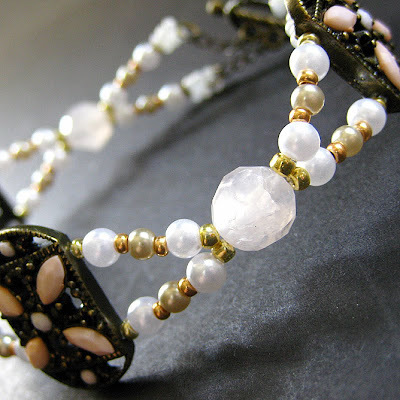 I've always felt that rose quartz and pearls go perfectly together, and when combined with the filigree bronze pieces, they all compliment each other beautifully in a sweet and pure handmade bracelet that's then finished off with a matching decorative toggle clasp. Rose quartz is known as the "stone of gentle love" by many civilizations and societies around the world and is believed to emit a calming, cooling energy. In metaphysical circles it's believed to help the wearer gently remove negativity from their lives and establish gentle, loving forces in their wake. This handmade rose quartz bracelet measures at 8-inches (20.5 cm) in length including clasp.